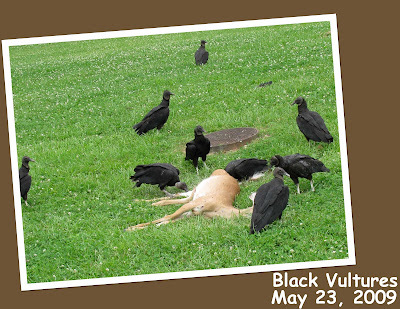 Driving home from the Franklin Wild Birds Unlimited store, I stopped at a light right there in Grassland, and there were a good dozen Black Vultures fighting over the carcass of a White-tailed deer that must have met his demise last night trying to cross Hillsboro Rd. Very sad, but... The Vultures knew what their job was, and got right to work cleaning up. Note their nearly featherless heads - this helps them stay clean when sticking their heads into carrion when feeding. 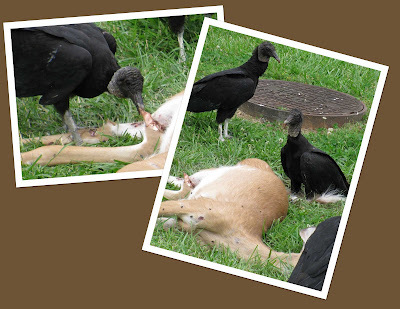 Black Vultures are often more aggressive than Turkey Vultures and may take over a cadaver that the Turkey Vultures have located and chase them away from it. Unlike Turkey Vultures which have a keen sense of smell, Black Vultures can find carrion only by sight--or by following the Turkey Vultures. Back to my interest in Names, and common Names: The scientific name comes from korax, the Greek word for raven; gyps, which means a vulture; and from the Latin word atratus, meaning to be clothed in black, as in mourning. 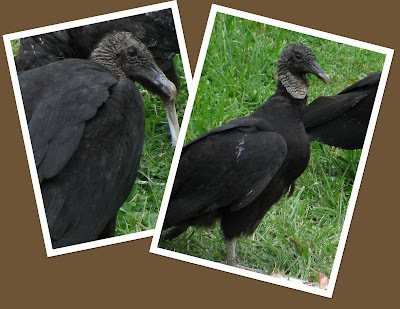 The Black Vulture has also been known as a Carrion Crow, Black Buzzard, and Jim Crow. Well, mixed feelings about the scene, but great pics of the vultures! I'm thinking about how *happy* the vultures are :-\ Yes.